One of my long cherished wishes came true when I visited this temple last Wednesday with all my family members. Sri Sureswaracharya was the most learned and aged of Sri Bhagavatpada's disciples. He was a native of Mahishmati. He was known as Mandana Mishra before He was initiated into the ascetic order by Sri Sankara Bhagavatpada. 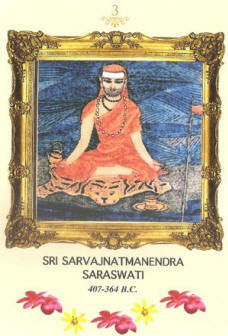 History of how Sri Sankara had a long debate with Sri Mandana Mishra on various topics in the poorva mimamsa and in Advaita Vedanta, and how Sri Mandana Mishra was defeated in arguments and how he was given sanyasi and taken along with Him by the great Acharya, is recorded in most biographies of Sankara. After a long and eventful career and having been the author of the Vaathika on Sankara's Brhadaranyopanishad Bhashya and having authored the famous philosophical treatise known as Naishkarmya-Sidhi, Sri Sureswaracharya shook off his mortal remains at Kanchi, the southern Mokshapuri, on Shukla Ekadasi of Jyestha in the Cyclic Year Bhava (407 B.C). 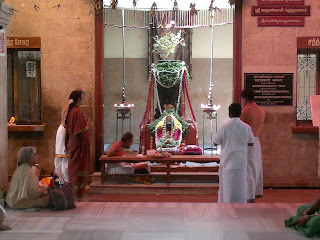 The presence of a street till recently under the name of Mandana Mishra Agraharam, and the presence of a stone icon of Sri Sureswaracharya inside the Sri Kanchi Kamakoti Sankaracharya Math (which is in daily worship) confirm the connection of Sri Sureswaracharya with Kanchi Sankara Math and his videha mukthi at Kanchi. This Pontiff was anointed as successor by Adi Sankara himself. 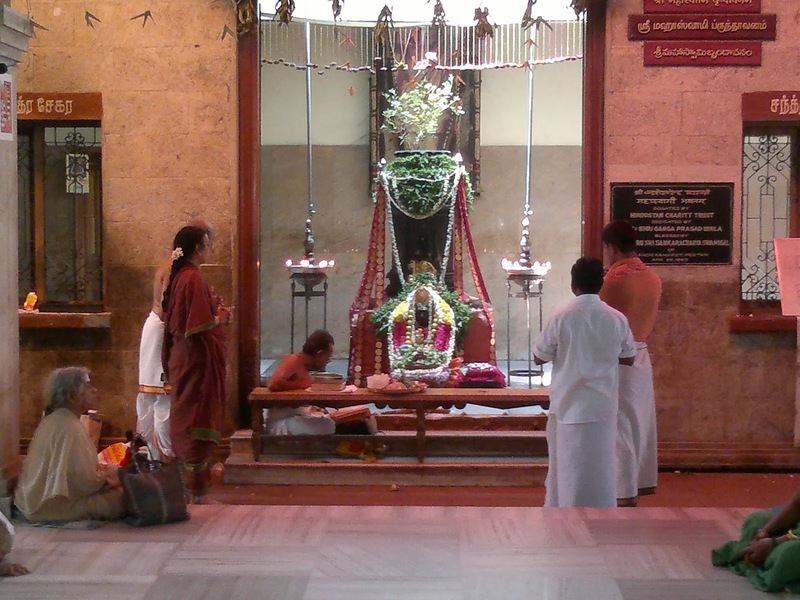 His Adhishtanam is right next to the Adhishtanam of Sri Sureswaracharya in the Mutt premises itself and in all humility is represented by a Tulsi plant in a pot. After having conquered the leaders of many heretic sects prevalent in many parts of India, Sri Sankara Bhagavatpada reached Kanchi, the southern Mokshapuri to spend the evening years of His life in that holy city. One of the famous incidents of Sri Sankara's stay at Kanchi is his Sarvajna Peethahoranam or ascending the seat of Omniscience. On knowing about this, scholars from various parts of the Tamil regions gathered at Kanchi to witness the grand event. Among those, a band of scholars from Brahmadesam and its neighborhood had a debate with the Acharya on Deva bedha, Moorthy bedha, etc. By his clear exposition of the Advaita doctrine, the Acharya silenced their arguments. After the successful ascending of the Sarvajna Peetha, Sri Sankara was attracted by a boy of 7 summers to be very precious. He sent word for the parents of the boy. They came with their son and bowed before Sri Sankara. Then the great Acharya expressed His wish to nominate the little boy as his successor to the Kanchi Peetha. The parents greatly rejoiced and agreed to the Acharya's proposal. Thereafter the Acharya initiated the boy Into sanyasa ashrama, gave him the deeksha name of Sarvajnatman. The Bala Sanyasi was put under the care of Sri Sureswaracharya. Sri Sarvajnatman presided over the Sri Kanchi Sankaracharya Math for a long number of years. He wrote a lucid summary or rather a further commentary on Sri Sankara's Sutra Bhashya. Sri Sarvajnatman's commentary is known as The Samkshepa Sareeraka. It is also said that He is the author of a poetical thesis called Sarvajna Vilasa. The Samkshepa Sareeraka of Sri Sarvajnatman contains 1267 verses couched in verses of elegance and easy style. After an eventful and glorious career Sri Sarvajnatman attained videha mukthi in Kanchi on the 14th day of the dark fortnight (Vaishaka Krishna Chaturdasi) of the cyclic year Nala (364 BC). Sri Swaminathan (born at Villupuram on 20th May 1894 -Anuradha Star) was taken to Kalavai in his 13th year, when he was studying at Tindivanam, to be initiated into ascetic order and ordained as the 68th Acharya of the Kanchi Kamakoti Math. He was given the Sanyasa name Sri Chandrasekharendra Saraswathi. He was affectionately called "Mahaswamigal" and "Walking God". He adorned the Peetam from February 13, 1907. True to the tradition of the Peetam set by Adi Sankara, Mahaswamigal travelled throughout the country by foot or by the traditional palanquin. He also stood by the national sentiments in discarding "foreign cloth" (He immersed them in water instead of setting fire) and started wearing Khadi. He set the trend to create Trusts for achieving the objectives of the Peeta. His foremost concern was preservation of the Vedas, tradition and dharma. He advocated simplicity, shunned pomp, ostentation and extravagance. His exposition of Vedanta, sastras and the dharmic duties attracted scholars and laymen alike, from far and wide, for it has always been rich in values and simple in understanding. Great humorist he had the keen acumen to relate root words of all the languages to Sanskrit highlighting its greatness. He attained moksha at Kancheepuram on 8th January 1994 (Dhanur, Krishna Dwadasi) in his Centenary year. Sri Subramaniyam, born on July 18, 1935 at Irulneekki in Thanjavur District had Veda Adyayanam at Tiruvidaimarudur under the direction of Mahaswamjgal and was initiated into Sanyasa on March 22, 1954 and was declared as successor Acharya and given the Sanyasa name Sri Jayendra Saraswathi . 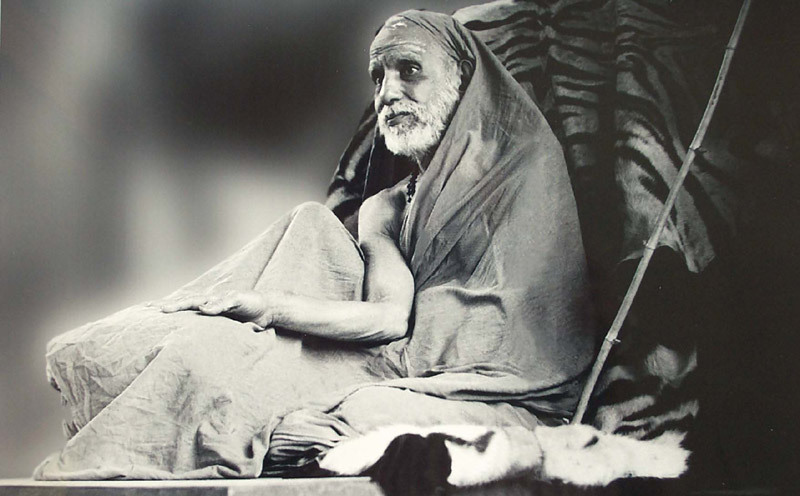 In the footsteps of the Mahaswamigal, He too undertook yatra throughout the country. He attracted people from every nook and corner. He intensified the activities of the Matam to cover new social objectives -education, health, employment, temple renovation etc. It is due to His untiring efforts, Kamakoti Peetam established religious and social institutions in many parts of the country. Kamakoti Peetam has now become a beehive of socio- religious renaissance. The King of Nepal has erected an arch "Welcome to the only Hindu Kingdom in the world" at the instance of Sri Jayendra Saraswathi, in 1988. The only Sankaracharya after the Adi Sankara to visit Manasarovar and Kailash is Sri Jayendra Saraswathi Swamigal, in 1998; there He installed the idol of Adi Sankara. He had the unique distinction in being honoured by both Nepal and Chinese Governments. In known recent history, He is the only Sankaracharya to visit Dhaka in Bangladesh in June 2000. In honouring His visit, Sri Dhakeswari Temple named the entrance to the temple as "Sankaracharya Gate". His most notable contribution yet is the founding of the Sri Chandrasekharendra Saraswathi Viswa Mahavidyalaya, a Deemed University in the name of His Guru.